1. 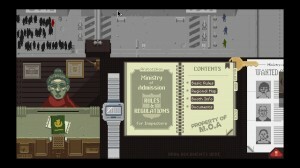 Papers, Please is a much easier game to slip into than Cart Life even though they’re both tackling Big Non-fun Things. I found the feedback loop much more rewarding and engaging – I’ve not yet got much beyond day 3 in Cart Life despite repeated attempts, because I’m not finding the flow within it. Maybe that’s the point, and Cart Life is supposed to be boring to play as well as simulating a boring experience. Maybe I just haven’t hit the sweet spot with it yet. But Papers, Please is doing something much more engaging for me. 2. A chunk of that is the way the game’s designed to tap skills I know I have. I am reasonably good at this game. I’m not sure you’re meant to be good at this game. I’m not sure that’s the point. I’m also not sure it’s meant to be fun, but I’ve gone back to it several times, so there’s definitely something satisfying going on here. 3. When I had a friend, the security guard outlined in green, I was terrified that a bomber or a gunman would kill him. It made me worse at the job. Whenever I had someone to help I was slower and more thorough because I was scared of letting them down, these meagre human connections. By contrast, when I was concentrating hardest on the tasks in hand, I stopped caring about any of the other characters. 4. Everyone has an agenda. Sometimes they’re incredibly clear what that agenda is; sometimes it’s obscured. Sometimes you get taken in. There is nothing in the game more bitter than going out of your way, risking financial or other punishments, for the sake of a little human kindness, and then having that thrown back in your face. Papers, Please is very good at making you quickly feel very bitter. I hated the inspector. I hated the people who abused me. I hated the journalists, in particular. 5. This is a game I would recommend for journalists to play. If you want good examples of how interactivity illuminates systems in a way that words, images, video and audio just can’t, this is right up there with the best. It is a game I would suggest for journalism courses, not for its content so much as for its methods. It is extremely powerful in what it conveys, with a very clear internal rhetoric, and I can easily imagine reskins that would make it a vehicle for understanding, say, border control in North Korea. 6. That said, some of the power behind the game’s EZIC storyline is that it is not realistic, at all; it reads better as the desperate power fantasy of a powerless official struggling to find meaning in what they’re doing. It has the qualities of delusion: shadowy figures, cryptic messages, strange codes. An ending in which things are just magically better, somehow. I was almost expecting it to turn out to be a test, a front for the secret police. Its implausibility only serves to point up the grinding cruelty of the situation you find yourself in. 7. And it is grinding, too, it is awful. The game distracts you from the humanity of what you’re doing by giving you puzzles to solve. Simple, absorbing tasks against the clock, requiring concentration and attention to detail. No time for empathy. No time to feel bad for the people you don’t let through, only just time to kick yourself for letting through one or two who bring your totals down. Like the gorilla at the basketball game, no spare mental bandwidth to take into account the little human gestures people make as they come through the checkpoint. Just when you are getting the hang of it, being able to rely on your memory and instincts, the game complicates itself. Before long you are a monster. 8. The process of checking someone’s documents manipulates the pacing in an enormously clever and carefully judged way. The frantic checking makes the imposed pauses problems to be overcome – you are impatient, annoyed at the time it takes for a fingerprint slip to print or a scan to be undergone. But you are also stopped in that moment, and it gives you seconds where you become suddenly, uncomfortably aware of the task you’re engaged in. It breaks flow. The scans, in particular – suddenly the player’s perspective shifts a little and you realise, as the scan prints, that this is a horribly degrading and largely meaningless thing. Then you flip the image, spot the package of drugs, and hit the detain or deny button, but you have had that moment of connection with your actions and it is deeply uncomfortable. Especially when you are checking gender. 9. I couldn’t play it through without doing the EZIC tasks. There is an ending for just doing your job, and I couldn’t get to it, knowing there was no hope.